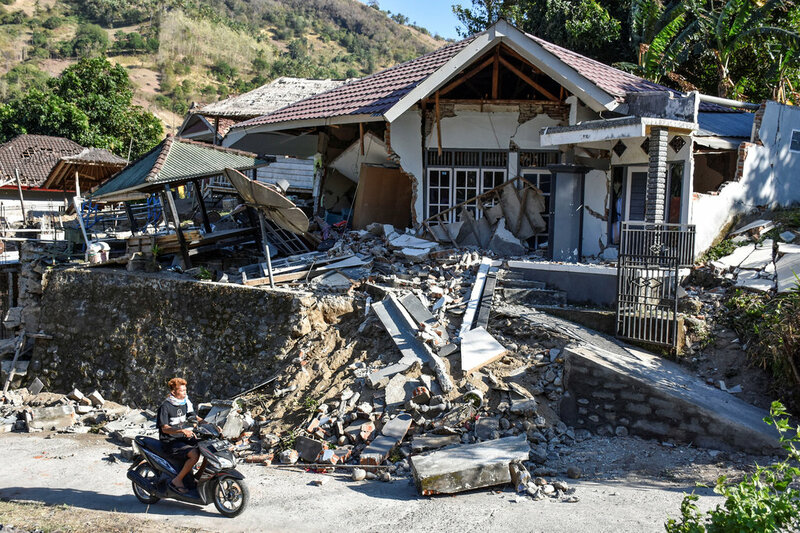 Over the weekend, a M=6.9 earthquake struck the Indonesian island of Lombok, just east of Bali. So far, there are at least 98 confirmed fatalities from this quake, which registered strong shaking across the popular tourist destinations. Initially, a tsunami warning was issued, but it was lifted after waves reached only 15 centimeters high. The majority of people killed and injured during the quake were struck by falling debris on were in collapsed buildings. While aid has begun to flow into the country, roads and bridges are significantly damaged, and much of the worst-hit areas remain without power and telecommunications network. 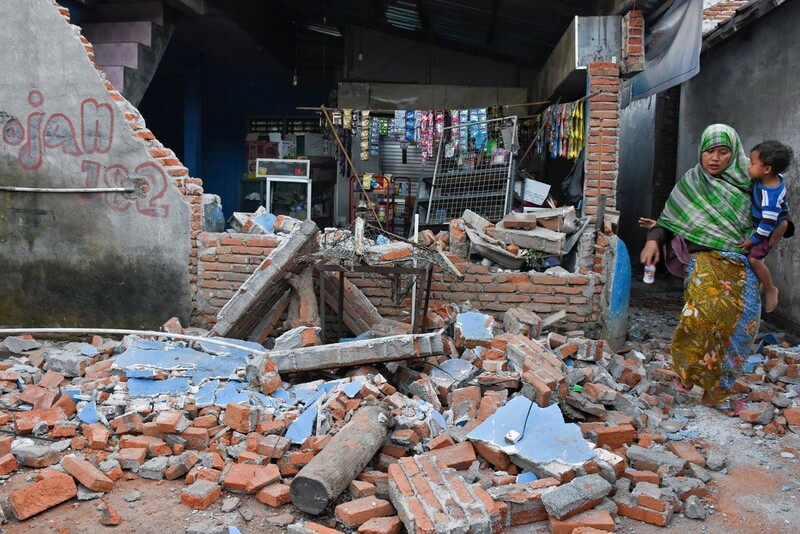 According to Sutopo Purwo Nugroho, a spokesman for the Indonesian Disaster Management Agency, the northern part of Lombok suffered massive damage. In total, at least 20,000 people have been left homeless. 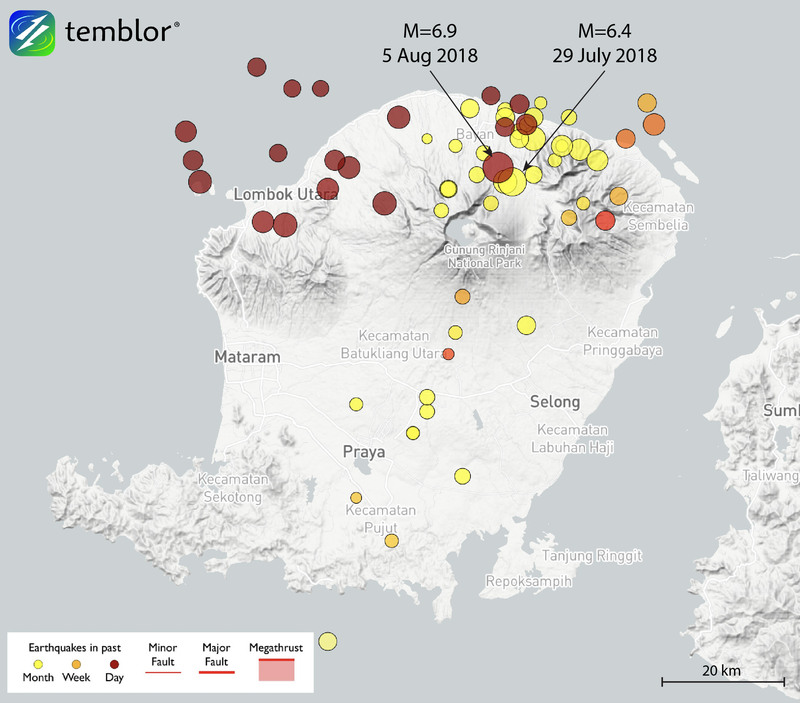 This Temblor map shows the locations of earthquake around the Indonesian island on Lombok. Both yesterday’s M=6.9 earthquake, as well as the deadly M=6.4 quake a week earlier are shown. Because of their spatial and temporal similarities, yesterday’s event can be considered an aftershock of the July 29th earthquake. 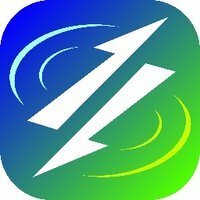 Since the quake, over 10,000 people have been evacuated from the island of Lombok. Additionally, boats have been sent to the nearby Gili Islands, which is a popular destination for backpackers and divers, to evacuate more than 1,000 tourists. The photo below shows hundreds of tourists on the beach awaiting evacuation. Meanwhile, on the nearby island of Bali, the airport suffered some damage, but is still operational. The earthquake over the weekend can be considered an aftershock of a M=6.4 earthquake which struck just a week ago, and left 16 people dead. 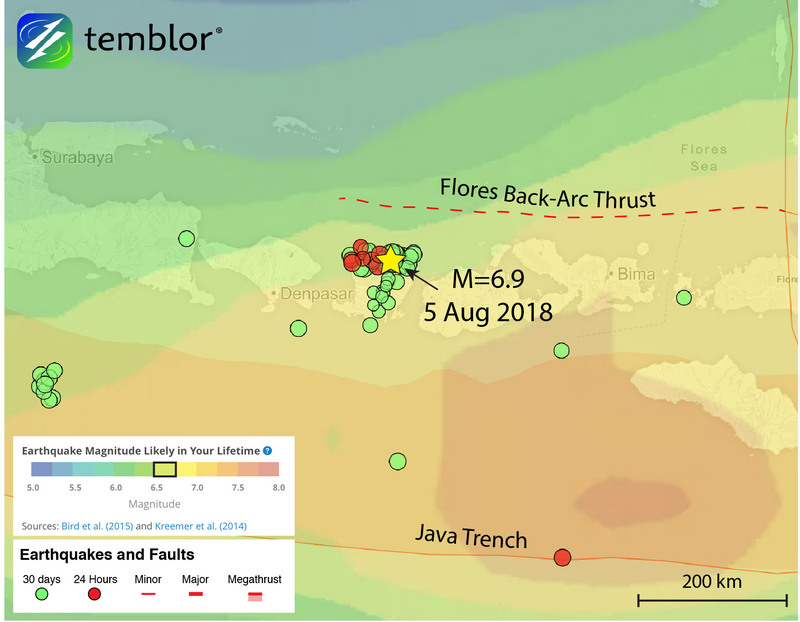 While the majority of earthquakes in this region occur on the Java Trench to the south of Lombok and Bali, the quake over the weekend appears to have struck on or near the Flores Back-Arc Thrust at a depth of 31 km. This back-arc thrust is associated with the compression at the Java Trench, and means that eastern Bali, and the island of Lombok are flanked by two large thrust faults. By using the Global Earthquake Activity Rate (GEAR) model, we can determine whether or not yesterday’s earthquake can be considered surprising. This model uses global strain rates and the last 40 years of seismicity to forecast the likely earthquake magnitude in your lifetime anywhere on earth. 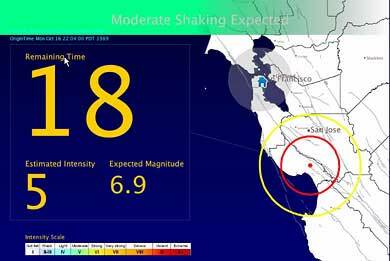 From the figure below, one can see that in the location of yesterday’s event, the likely earthquake is a M=6.5-6.75. Therefore, the magnitude can be considered relatively surprising but not unheard of for the region. This Temblor map shows the Global Earthquake Activity Rate (GEAR) model for the area around yesterday’s earthquake in Indonesia. This model uses global strain rates and the last 40 years of seismicity to forecast the likely earthquake magnitude in your lifetime anywhere on earth. From this model, one can see that in the location of yesterday’s event, the likely earthquake is M=6.5-6.75, meaning a M=6.9 quake can be considered relatively surprising.